One of the core cycles of myth belonging to the Aztecs is the multipart epic of how they went from their humble beginning as an obscure band of nomads to the lords of Tenochtitlan and the founders of a great empire, all under Huitzilopochtli’s watchful eye. In honor of the festival months of Quecholli (beginning today) and Panquetzaliztli, the veintanas celebrating the Chichimec past and the god who led them to glory, I will be kicking off a special storytelling event. Over the course of November and first week of December, I will be retelling the highlights of the series of legends that comprise this important saga of the Mexica-Tenochca people. The basic timeline of the Foundation Cycle starts with the big entrance of Huitzilopochtli onto the scene with the Battle of Coatepec. I’ve already posted that one, and I recommend checking it out if you haven’t read it yet, as it sets the stage for things to come. Once Huitzilopochtli’s arrived, He picks out the Mexica as His own favorite tribe and calls them to leave their ancestral homelands in the north and begin their migration south, deep into the Anahuac Valley. He promises to guard them and guide them to a new home, a place where they will found a mighty empire. 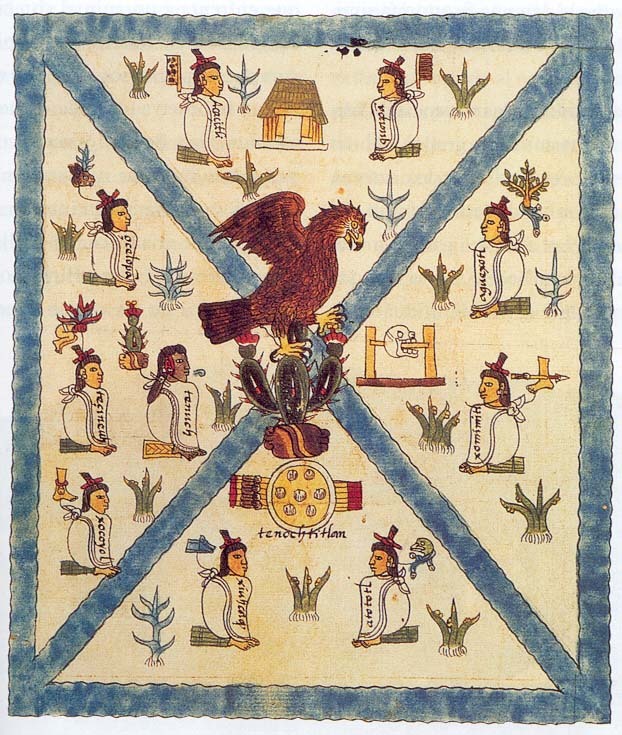 They trust in Him and head out, overcoming both human and divine opponents until they eventually reach the place where the eagle perches on the nopal cactus, eating a heart — the sign that they have finally found their new home… Tenochtitlan.